Diabetes mellitus is a chronic metabolic disease that requires self-management education to prevent acute complications and reduce the risk of long-term complications. 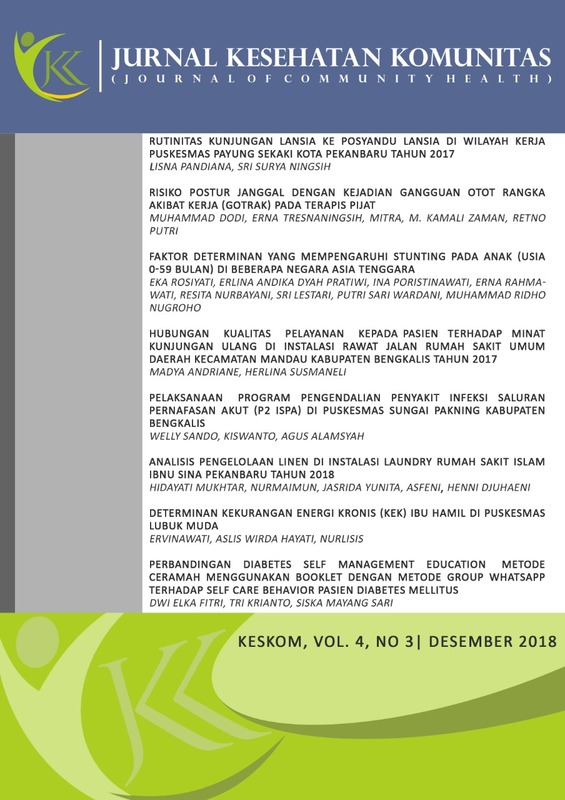 Diabetes Self Management Education (DSME) can be used as an effective method in improving self-care of patient with diabetes mellitus when discharged from the hospital. In the implementation of education in patients, many methods can be done. The lecturing method is one of the most commonly used methods in conducting health education, one of which is to used a booklet. Another method can be used is to use the whatsapp group application. The purpose of this study was to find out the differences between DSME method by using booklet and social media method on care behavior of diabetes mellitus patients. The research design of this study was quantitative by using quasy-experiment approach with two groups pretest-posttest. Sample in this research are diabetes patient in the outpatient room, the collecting sample was used concecutive sampling with 30 people divided into 2 groups. The analysis used was univariate and bivariate analysis using paired sample t-test and independent sample t-test. The independent t-test result were obtained p value = 0.001 is smaller than alpha value (p < 0.05) with different mean, namely -15,33. It can be concluded that diabetes self management education by using social media (whatsapp group) was more inluential in improving self care behavior than diabetes self management education by using lecturing method with booklet. From the results of this study, it is expected that hospitals can educate DM patients by following the DSME principle with the WhatsApp group method. Diabetes mellitus (DM) is a chronic metabolic disease that requires self-management education to prevent acute complications and reduce the risk of long-term complications. DSME can be used as an effective method in improving self-care of patient with diabetes mellitus when discharged from the hospital. In the implementation of education in patients, many methods can be done. The lecturing method is one of the most commonly used methods in health education, one of them is to use a booklet. Another method that can be done is to use the whatsapp application group. The purpose of this study was to find out the differences between DSME method using booklet and social media method against care behavior of diabetes mellitus patients. Type of this study was quantitative using quasy-experiment approach with two groups pre test-post test. Samples in this research were diabetes patient in the outpatient room, the collecting sample was used consecutive sampling with 30 people divided into two groups. This research used the modification of summary self care diabetic activity questionnaire. The analysis used was univariate and bivariate analysis using paired sample t-test and independent sample t-test. The independent t-test result was obtained p value = 0.001 was smaller than alpha value (p < 0.05) with different mean, namely -15,33. It can be concluded that diabetes self management education by using social media (whatsapp group) was more effective in improving self care behavior than diabetes self management education by using lecturing method with booklet. The results of this study, it is expected that hospitals can educate DM patients by following the DSME principle with WhatsApp group.